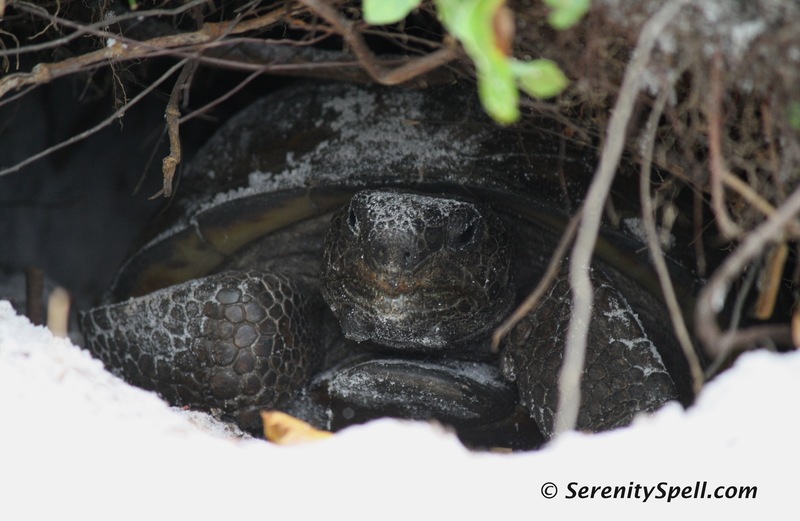 We often encounter gopher tortoises on our hikes in Florida’s natural spaces; not just in the far reaches — and there have been times when they’ve needed some help with humans’ encroachment into their land. This poor guy was trapped behind acres of personal enclosure, and had been trying to burrow in the mulch; there were dozens of failed holes to attest to his failed attempts. We stayed awhile, to see if he could manage an escape on his own (or if he was simply choosing that location), but then saw how the fence was buried, impeding his escape. Between the buried fencing, his constant dodging at the barrier, and the myriad failed burrows, it was easy to understand his dilemma. We quickly relocated him to a perfect burrow-able location nearby — literally five feet from his manic failed and impossible attempts behind the fencing, where his natural habitat awaited him. NOTE: With turtles and tortoises (of the water and land varieties), help them safely in the direction they’re heading. It would have been nice for the actual property owners to have accomplished this tiny feat, of course — it wasn’t difficult to witness the poor guy’s quandary (or his efforts); these aren’t small tortoises. One of the oldest living species, the burrowing tortoise is found throughout Florida and southern Georgia, South Carolina, Mississippi, Alabama, and eastern Louisiana. They dig and live in long burrows in pine savannas, thus protected from summer heat, winter cold, fire, and predators. Gopher tortoises are essential to the local ecology — their burrows also provide homes for other animals, including indigo snakes, gopher frogs, mice, foxes, skunks, opossums, rabbits, quail, armadillos, burrowing owls, snakes, lizards, frogs, toads, and other invertebrates. Their burrows — abandoned or shared — may be the homes to more than 300 species of animals at one time or another. Pretty amazing; and it’s easy to see how destroying the habitat of the gopher tortoise greatly alters the already fragile ecosystem. Federally protected as a threatened species (FINALLY in Florida, where the status was “under review” for years), the tortoise’s main threat remains: Habitat loss and destruction. For instance, it wasn’t until 2007 in Florida, that developers were forced *by law* to relocate burrowing tortoises — until then, development could shockingly occur with no thought to the safety of the animals and the destruction of their habitat. It was only then that the Gopher Tortoise Management Plan was implemented. Like a baseball player stretching muscles and practicing skills during spring training, the gopher tortoise is emerging from winter dormancy and moving slowly and steadily through the landscape in search of greenery to eat and a new place to dig its burrow. 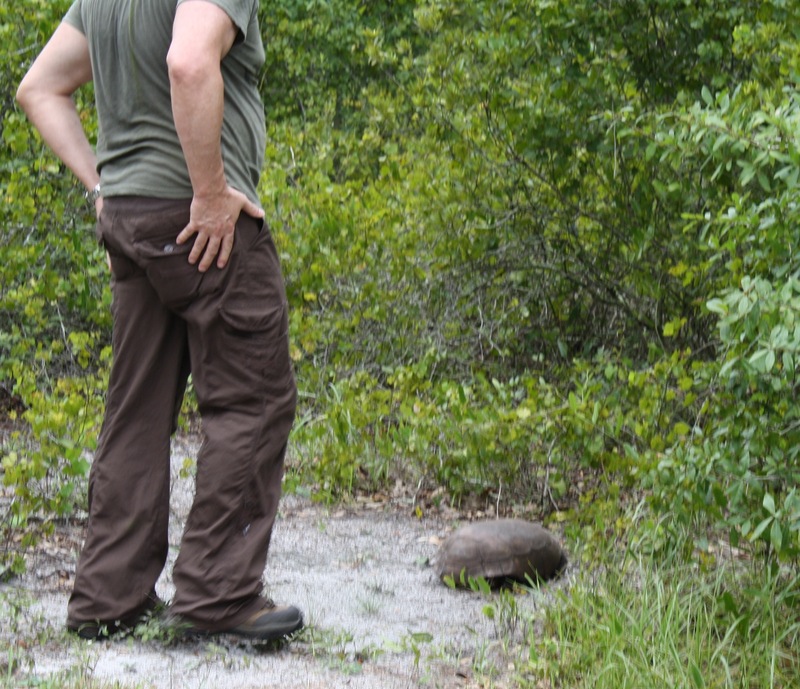 Look for gopher tortoises’ distinctive domed brown shells and stumpy legs, as these land-dwellers make their way through Florida’s open canopy forests and sandy areas. The Florida Fish and Wildlife Conservation Commission asks people to remember that gopher tortoises are good neighbors, and can live from 40 to 60 years, so leave them and their burrows alone. For the rest of this blog post and more on the Gopher Tortoise Management Plan, visit Florida Restores 36,000 Acres For Tortoise Habitat. Amazing and informative article. I have vacationed in FL for years, but have never seen a gopher tortoise. Until you wrote this, I never knew about them. What fascinating creatures! We cherish our beloved Harriet. We use no poisons, chemicals or any toxins on our little 1 acre here in the Ocala Forest because of her and our Airedale Breanna. Everybody is safe from poisons and Harriet prefers her “weeds” au natural! She’s BEAUTIFUL! And a double-yay to you for being poison-free — why am I not surprised? 🙂 I am, as well… And it’s so great — I don’t have much land, but what I’ve crammed in it (natives) thrive so well. And those who use the poisons? Little to no growth. Just sayin’. I’ve encountered much wildlife within my little yard — birds, turtles, raccoons, opossum, etc. — and I don’t want the poison to hurt them. Now if we could only convince the rest of the state to go au natural! AND native! I love seeing the wildlife nibble on the natives I’ve planted…!! And I have a tiny space. Can you imagine if more took part? I think more are, but it’s slow-going….